SPOILERS for both the Howl’s Moving Castle film and novel. Released in Japan in 2004, Howl’s Moving Castle remains one of Studio Ghibli’s classic films. But to anyone who was inspired to read the book it’s based on (written by Diana Wynne Jones), the film reads less like an adaptation than a complete reimagining. While the main cast remains essentially the same, much of its complicated plot is removed, characters are deleted or combined, and a minor war is expanded into a heavy specter that looms over the entire movie. One of the biggest changes is the character arc of our protagonist, Sophie Hatter. In both versions of the story, Sophie is a young woman trapped by societal expectations. In both versions, the curse that transforms her into an elderly woman is also the catalyst she needs to shrug off these burdens. But where Sophie starts and ends is enormously different. While book Sophie overcomes her fear of failure by finally owning up to her dangerous recklessness and accepting the consequences of her actions, film Sophie finds that shedding self-doubt is what makes her beautiful rather than her physical appearance. This is not a bad change or one that undermines the story. It simply serves the purpose of the type of narrative it tells. Where the book is a fantasy that explores women’s roles in society, the film is a love story that heavily relies on visual shorthand. But why did this change happen in the first place? 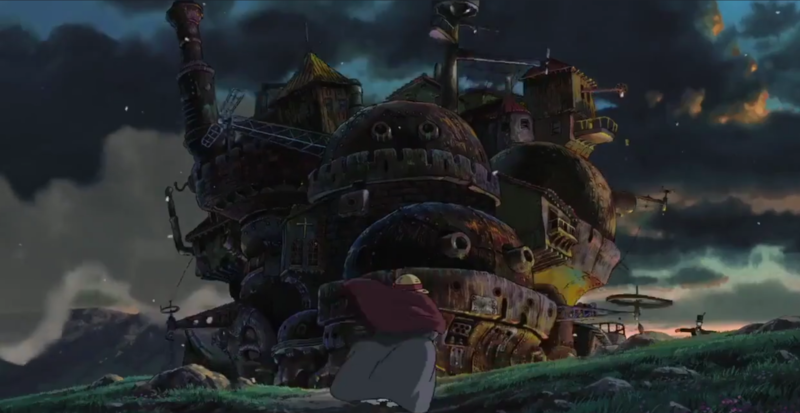 Without input from Studio Ghibli, it’s hard to say. But two factors figure significantly into the equation: the needs of each medium and the type of story each tries to tell. So let’s take a closer look at the choices each made and how they impacted the final version of the story. Both the novel and film begin in the same way: after being cursed to become an old woman by a jealous witch, Sophie Hatter runs away from home and ends up getting hired as a cleaning lady for a rakish wizard named Howl who lives in a magical moving castle. There, she strikes up a deal with Howl’s personal demon: he will break her curse if she can break his contract with Howl. At this point, the plots diverge. Where the book closely follows Sophie’s investigation into Howl’s contract and Howl’s half-hearted search for a missing prince, the film focuses on Sophie’s relationship with Howl and the war they are trying to evade. Many of the plot and character differences between the book and film are directly tied to the format. Because most movies are limited to somewhere between 90 to 180 minutes, their storytelling is compressed. Good cinematic storytelling is efficient. But because a picture is worth a thousand words, visuals are better-suited to streamlined narratives. In contrast, a novel has the time and luxury to delve into a character’s headspace. The best demonstration of this in Howl’s Moving Castle is in our introduction to Sophie. Compared to the 12 pages that describe Sophie, her family’s recent financial trouble, and the duties she has taken on in their shop to help out, the movie dedicates only two minutes to this sequence. While working in the hat shop, Sophie turns down an offer to join coworkers on an outing but stares longingly out a small window. Both deliver the same emotional message: Sophie works too much and is lonely. The downside to this efficiency is that there is not always room for context. The book explains to us that Sophie’s self-isolating behavior is unusual. Her father has passed and her stepmother can no longer afford to keep three daughters in school. As the eldest in her family, Sophie resigns herself to working at the family hat shop while her younger sisters are sent off to glamorous apprenticeships. But even though she won’t admit it, she still wants to have her own adventure and the resulting internal conflict causes her to withdraw socially. However, the movie has to make a choice: Show how Sophie ended up so lonely, or dedicate more time to the plot? Because this particular story includes flashy wizardry, war, and time travel, they ultimately cut Sophie’s back-story. The audience sees that Sophie is lonely, but is not given a reason for why. Consequently, it’s easy to infer that this antisocial behavior is normal for her. While it’s definitely easier to show unhappiness with one’s looks than a complex interplay of grief, familial duty, and giving up one’s dreams, it’s not the only option the film could have settled on. Sophie could easily have yearned for freedom or for adventure, even without the explanation about her family troubles. So why didn’t the movie do this? A big part of it may simply be perspective. The book is a female-authored fantasy, likely written for a largely female audience. And for all that director Hayao Miyazaki is known for compelling female protagonists, he is still a man with a very different lived experience from Jones and much of her target audience. However, it’s also worth noting that Howl’s Moving Castle is one of only a few movies written and directed by Miyazaki that was marketed as a romance rather than a fantasy or action epic. It’s quite possible that the male perspective and the romantic angle together suggested the cliché of a woman with insecurities about her appearance over other character archetypes. It’s a common trope, after all: a woman doesn’t believe she’s beautiful until a man who loves her convinces her otherwise. A Fantastic Romance or a Romantic Fantasy? Most viewers probably remember Howl’s Moving Castle as a love story, which the book is decidedly not. While Jones is known as a fantasy author primarily, her stories are often more mysteries than traditional fantasy epics – much like the Harry Potter series. In almost every book, the characters attempt to solve a puzzle, whether that’s how the protagonist’s parents died or why a stranger keeps appearing in the woods. So while Sophie does fall in love with Howl in the book, her focus is on the mystery of breaking the contract with his demon. In many ways, Sophie’s intense focus feels as if she is purposely avoiding thinking about her relationship with Howl. It isn’t until almost the last page that Sophie and Howl even admit their feelings for one another. On top of this is Sophie’s deep-seated belief that she is a failure. In this world, most people believe that the youngest daughter of a family is destined for success – and as the eldest of three, Sophie is not. This self-defeating lament is frustrating, but she also finds it a comfort: it allows her to blame her mistakes on something she can’t change. The curse that transforms her becomes a physical manifestation of this problem. Although it shortens her lifespan and leads to health problems, becoming old also has its perks. She finds that she can behave as rudely as she pleases and people will simply accept it as her being an eccentric elderly woman. When Howl accuses her of “liking being in disguise,” (p. 283) she loses her temper – but he has a point. Being old, like being the eldest, has become comfortable for her and she becomes strangely reluctant to break the curse. In the end, though, she is forced to realize that being the eldest isn’t a legitimate reason for making mistakes. It’s an excuse. Though this realization doesn’t stop her from making mistakes, it does leave her better equipped to deal with the consequences. That this realization also enables her to finally make a move on Howl is a bonus, rather than the point of the story. In the same way, the curse also encourages film Sophie’s worse tendencies. Like her book counterpart, she suffers from considerable self-doubt. The curse gives her social and personal freedom, but it also feeds into her insecurities. As a young woman, she thought herself “not pretty” and as an old woman, she feels downright ugly. The curse is a double-edged sword. But instead of allowing Sophie to retreat from her feelings, the film dedicates much of its runtime to building the relationship between Sophie and Howl. Where their first meeting in the book is described in less than a page, the movie dedicates an entire sequence to their accidental run-in on the street, climaxing with one of its most memorable scenes: the walk in the sky. It is a thrilling, intimate sequence that not only features the movie’s first display of magic, but also Sophie’s first sincere smile. The rest of the film is built around similar moments between Sophie and Howl as their relationship develops, from his catastrophic meltdown when she cleans up his bathroom to their quiet discussion of the future in a meadow. This is a story about a romance that happens to take place in fantasy world, rather than a fantasy that happens to have romance. This is not necessarily a bad choice. In fact, Sophie and Howl’s romance is one of the strongest parts of the story and makes it easy to overlook its weak ending. However, this shift in focus does result in a pretty major character change for our protagonist. But does that mean the movie is worse than the book? While I’d argue that the movie relies on well-worn romantic tropes more than the book, that doesn’t make it a worse story. In fact, the movie gets points for twisting the “I’m not beautiful” trope in a number of ways. Howl’s opinion about Sophie’s beauty doesn’t actually wipe away her insecurity. When she calls herself “not very pretty” as a way to undervalue the support she can give Howl, he immediately disagrees—but she doesn’t even seem to hear him. It isn’t until later, after she’s saved her newfound family from falling bombs, talked a demon into making a deal, and broken Howl’s curse that she feels confident enough to enthusiastically agree with his compliments. It’s not that she feels beautiful because a man legitimized her. She’s become comfortable enough with herself that she doesn’t care anymore. Both the book and the movie are also remarkable in that they center an old woman as the protagonist of a fantasy and a romance. Rather than going on an adventure despite her age, Sophie goes on one because of her age. Without the curse, she never would have left home to seek her fortune in the first place. Furthermore, by becoming old, Sophie becomes less anxious about social mores and feels freer to speak her mind. Best of all, being old does not make her any less desirable as a romantic interest. Both versions of the story defy the social rules that dictate a woman becomes useless after she’s lost her youth and the ability to bear children. In both iterations, Howl’s Moving Castle is ultimately a story about confronting your self-doubt in the most literal way possible. What those self-doubts are don’t necessarily matter. Society gives all of us enough options for insecurities that the message applies regardless. So if you haven’t read the book, check it out. It’s a far cry from the film. But if you enjoyed watching Sophie working through her insecurities and learning magic while falling in love, you won’t be disappointed. Genevieve is a California-based technical and marketing editor who dabbles in media critique and comics. You can find her stream-of-consciousness discussions of movies, games, and books on Twitter and her art on Instagram or at her portfolio.